We like fish. The waters of the North-East coast are a source of the most delicious fresh fish, often sourced from Hodgson’s of Hartlepool. 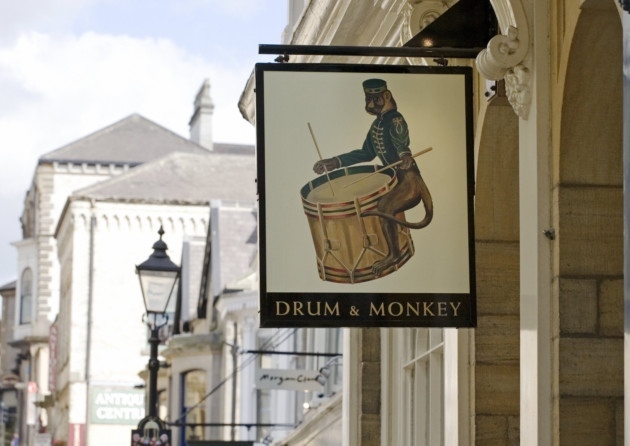 The Drum and Monkey could have been one of the doomed pubs, an elegant corner pub on a terraced street, stone and glass; the interior probably much as it was when the beer pumps were removed and the sawdust swept up. Fortunately, it became the Drum & Money Fish Restaurant, about 40 years ago, just down the Ginnel – the street really is called that though they attach themselves to Montpellier Gardens. We’ve been going for about thirty of those forty years, most often just for lunch. A bowl of lobster bisque and soft granary bread and butter; glass of Sauvignon Blanc or Chablis for a special occasion – now it’s the ubiquitous Picpoul de Pinet – and some water; coffee and the little mints wrapped up in foil. The fish pie is worth the wait if you need something a little more substantial. You didn’t used to be able to book downstairs – only in the upstairs restaurant – so you either got there at 11:54 just as it opened, or waited until 13:46 for a table. It’s a bit easier now and you’re more guaranteed of a seat, though they still don’t take bookings. On a recent visit we said the place seemed different somehow, lighter, simpler perhaps …”we’ve cleaned the windows” was the reply. Ah, plus ça change…. When so many restaurants are “made over” or “designed’ this one just remains as it always was. A little tweak here and there [apart from the windows] just to acknowledge the passing of time. We still see the same regulars in there – the gliterati of Harrogate for the very good value lunch, so the change isn’t too radical. Apart from the windows.